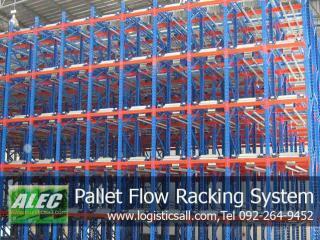 Pallet Flow Racking System ช่วยลดค่าใช้จ่ายในด้านการจัดเก็บ เนื่องจากสามารถประหยัดแรงงาน และพื้นที่ได้ถึง 25-50% ช่วยเพิ่มประสิทธิภาพในการควบคุม First In,First Out โดยมีสินค้าโชว์อยู่ด้านนอกเพียงด้านเดียว ทำให้การตรวจเช็คเป็นไปได้อย่างถูกต้อง รวดเร็ว และป้องกันสินค้าขาดช่วง โดยสามารถตรวจเช็คได้จาก Filling Card Pallet Flow Racking System Specially constructed lanes of gravity inclined tracks stacked side by side and on top of each other within a pallet rack framework form a solid block of storage that is fed in from one end and unloaded at the other. 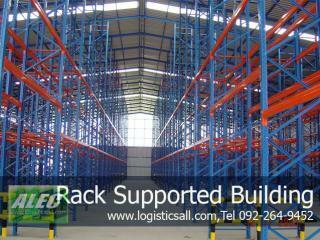 Consistent loads are stored in each lane, for the same SKU. 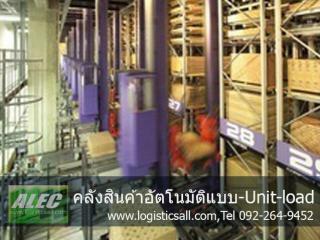 Automatic rotation is provided rack utilization is often at 90%. 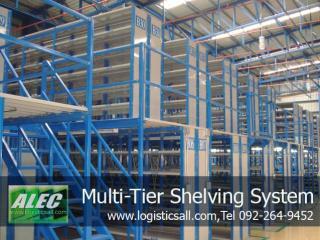 Advantages Very dense storage achieved especially when few SKU’s and high number of pallets. First In First Out (FIFO) guaranteed, ideal for products with shelf life or absolute rotation. 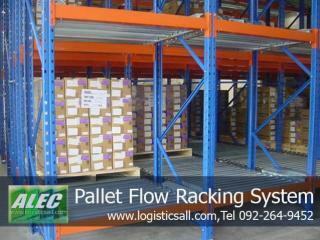 Secure and safety handling as the pallet truck does not enter the rack. 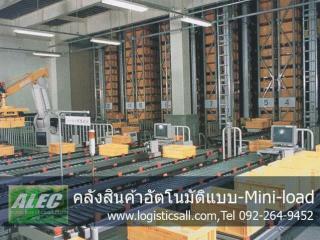 Stable loads and constant, high quantity pallet mandatory. 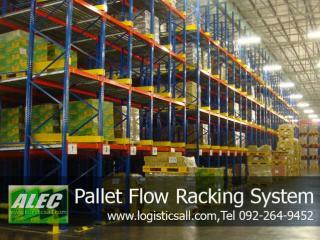 Wide range of pallets can be accommodated at the design stage.